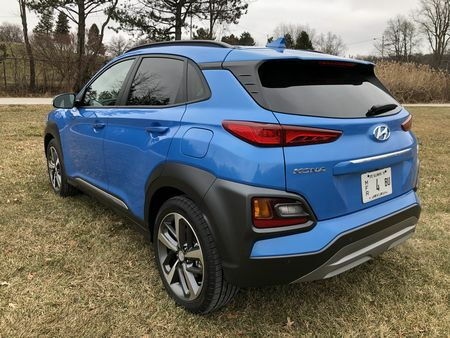 2019 changes to Hyundai's smallest crossover are all for the good and include a new battery-electric version coming this spring, while forward collision warning, automatic emergency braking, lane keep assist, and driver attention alert are now standard across all trim levels. As we've previously noted, the Kona looks best when rendered in either gray or black, as both colors tend to offset its more egregious styling cues. We have no quarrel with the highly-sculpted body, the narrow tail lights, or the tall mesh grille and high-mounted LED daytime running lamps up front, even though the latter suggest the current-gen Jeep Cherokee, pre face-lift - not necessarily a good thing. What we take exception to is the Kona's chunky "smart armor" cladding that envelops the low-mounted headlamp pods up front as well as the turn signal/backup light/reflector pods that dominate the rear fascia, creating fussy and awkward look that distracts from what is otherwise a clean, tasteful design. 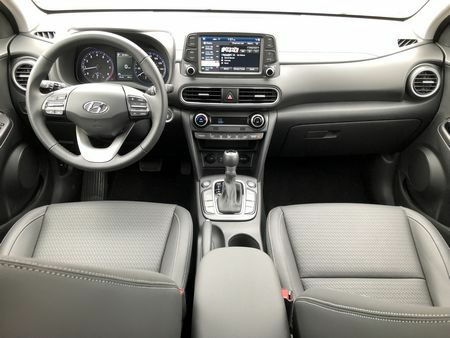 That exaggerated exterior, however, contains a more conventional interior that's a step above the class with higher-rent, matte-finished, nicely-textured interior trim that extends to the cargo space, cloth on the base model that looks and feels better than its price requires, and a logical layout of buttons and knobs. The high front seating position makes ingress and egress easy. 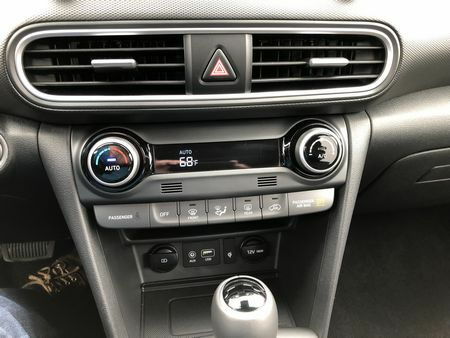 The various panels fit together nicely, and the center console, the front portion of which is open, offering a small storage shelf, two power outlets, one USB port, and one AUX port, features a soft armrest with a small storage bin. 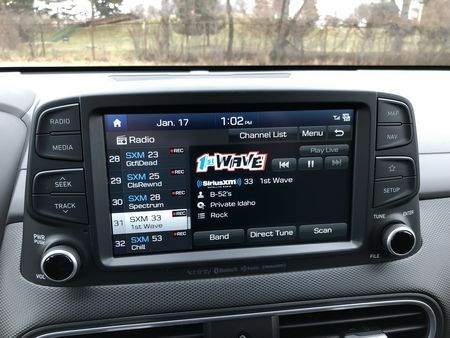 Either a seven- (SE, SEL, Limited) or eight-inch (Ultimate) color touchscreen dominates the center dash, with redundant buttons on either side operating the major functions, making setting presets and pairing phones a snap, while Apple CarPlay and Android Auto capability are standard across all trim levels. 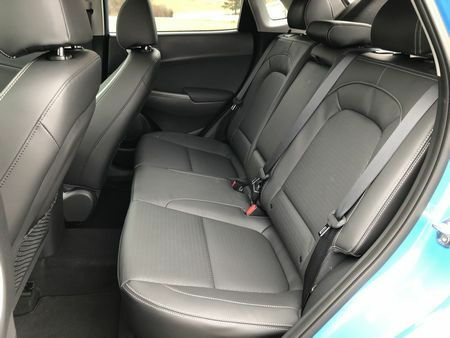 The front seats are comfortable, with plenty of leg, hip, shoulder and headroom for two adults of practically any size, with decent sight lines out the front and sides thanks to narrow A-pillars, while loading and unloading is aided by a low load floor and wide rear hatch opening. With both rear seats flipped forward, we were able to load a 52cm road bike without having to remove the front wheel – although the front wheel had to be angled nearly upright in order to close the rear hatch. Checking the other side of the ledger, cloth trimmed SE and SEL models – sans a sunroof that's unavailable– feel dark and downright cave-like and, despite a small window, the wide C-pillar blocks much of the rear three-quarters view, while the view out back is hindered by the rear headrests and a smallish rear window. 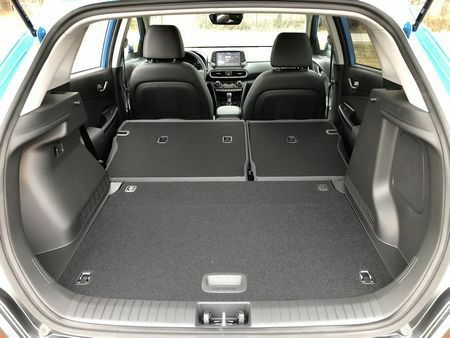 At the same time, 19.2 cubic feet of cargo room behind the rear seats that expands to 45.8 cubic feet when they're folded is only average for the class. 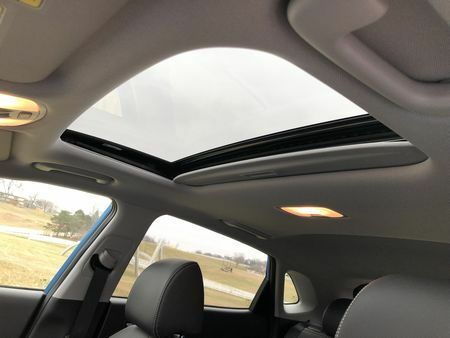 And although the Kona can technically accommodate five adults, notwithstanding an abundance of head room, we wouldn't recommend three across in back on longer trips as leg room in back can be tight for those above average in height. 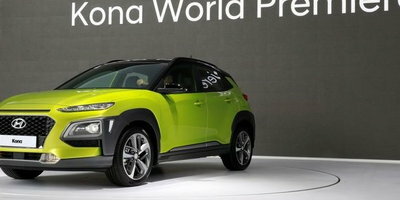 Until the electric version reaches dealers in early 2019, the Kona will be offered with a pair of engine/transmission combinations, depending on trim level. SE and SEL models are equipped with a 147 horsepower, 2.0-liter four-cylinder mated to a conventional six-speed automatic, while Limited and Ultimate trims are equipped with a 175 horsepower, 1.6-liter turbocharged four-cylinder. Fuel economy is competitive for both engines, with an EPA-estimated 27 miles per gallon city, 33 mpg highway, and 30 combined for the 2.0-liter engine with front-wheel drive, and 25 city, 30 highway, and 27 combined mpg for all-wheel-drive models. For its part, the 1.6-liter turbo scores an EPA-estimated 28 city, 32 highway, and 30 combined mpg with FWD, and 26 city, 29 highway, and 27 combined mpg with AWD. We observed a vehicle-measured 21.6 miles per gallon in our Ultimate tester in some pretty aggressive city driving. The 1.6-liter turbocharged four-cylinder, found on models like our Ultimate tester, features quick off-the-line performance with maximum torque available at a low and very useful 1,500 rpm. Although hardly a back roads corner-carver, especially with the turbo, the Kona is much more fun to drive than most of its competitors. 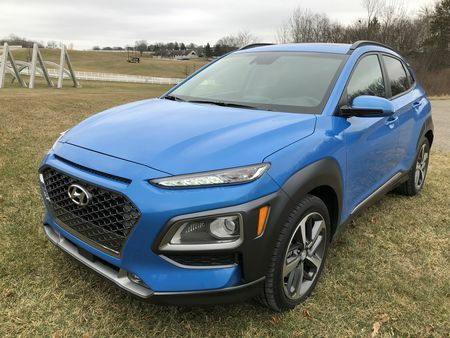 Not quite as agile as the Mazda CX-3, the 1.6-liter unit more than makes up for that with with twenty-seven additional horsepower and nearly fifty more lb-ft of torque. 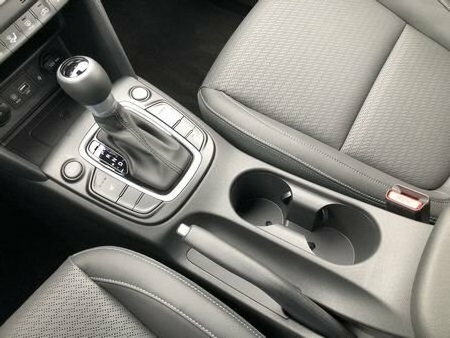 While some critics have noted that the seven-speed dual clutch transmission isn't the smoothest, especially at low rpm, we didn't experience any transmission-related low-speed performance issues. The suspension consists of MacPherson struts up front, with FWD models featuring a torsion beam in back that's replaced on AWD models with our favorite a multi-link setup. Both are calibrated for ride quality over handling, doing a nice job of absorbing both major and minor road imperfections. The steering is nicely weighted with a surprising amount of feedback, the brakes are easy to modulate, and there's a nice initial bite to the brake pads. 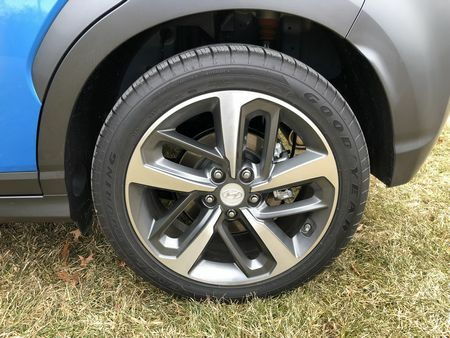 But like most small crossovers, a middling 6.7 inches of ground clearance won't inspire off-roading – not that the all-wheel-drive system is remotely up to the task. Cornering induces body lean that's typical for a vehicle of this height and class, while fuel economy in the more efficient turbo isn't markedly better than the base engine. 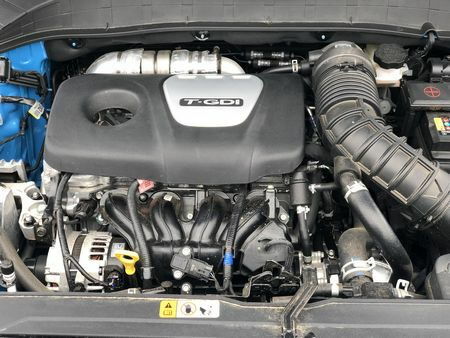 Speaking of which, peak torque in the normally-aspirated 2.0-liter engine isn't realized until 4,500 rpm, producing adequate but more leisurely off the line acceleration and requiring a bit of preparation before merging and passing at freeway speeds. 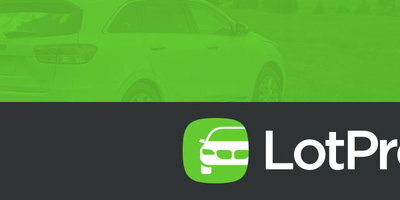 Finally, road noise – a characteristic shared by many vehicles in this class – is readily apparent, especially over rough and uneven road surfaces. 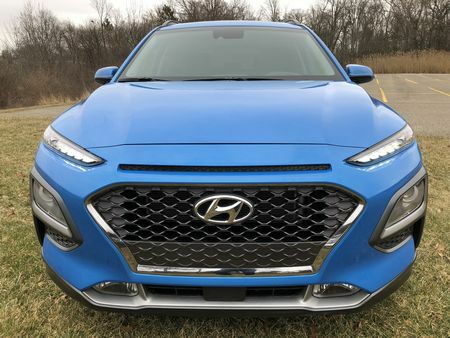 Pricing for the 2019 Hyundai Kona starts at $21,035 (including destination) for a front-wheel-drive SE and rises to $30,070 for an Ultimate model equipped with floor mats and all-wheel drive. SEL and Limited trims fill the gap. 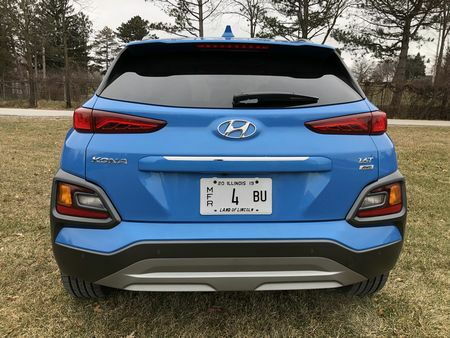 Hyundai's value proposition is apparent on even on the entry trim with the usual power features plus 16-inch alloy wheels, automatic projector headlights, LED daytime running lights, and a rear cargo area cover. We'd look at the model just below our Ultimate tester. 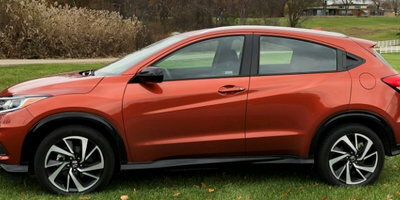 The Limited comes with the same 1.6-liter turbo plus 18-inch alloy wheels, LED headlights, sunroof, a leather-wrapped steering wheel and shift knob, leather seating, heated front seats, a proximity key with push button start, satellite radio, heated outside mirrors with turn signals, rear cross-traffic alert, and blind-spot monitoring. Additional safety features include blind spot warning and rear cross-traffic alert. 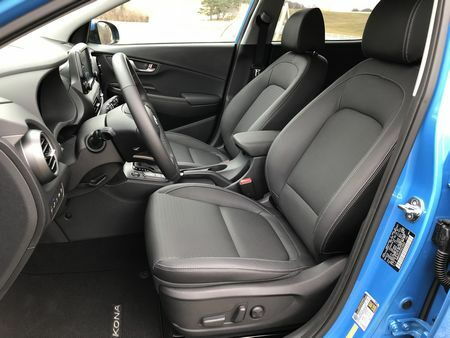 We'd also opt for all-wheel drive with the more sophisticated multi-link rear suspension and an MSRP, including floor mats and destination, of $26,720. 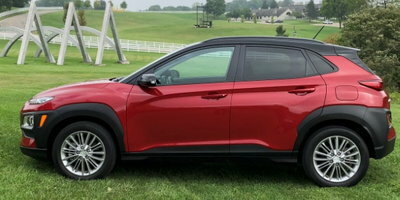 Although de-cluttering the exterior, offering more power in the base engine, and even swapping the DCT for a conventional automatic would all be improvements, as it is, the 2019 Kona brings Hyundai's value proposition to the small crossover class with an upscale cabin, deft handling, and a standard equipment list that includes a range of advanced safety features, making it one of the top picks in the small crossover class.